The kaftans plus size women are raving about! So soft and comfortable! Today I was reading about Caftans and Casseroles Parties, where everyone wears a kaftan and sits around eating comfort food. What could be better?! Sounds like my kind of party! Whether you are looking for something to wear to your next caftan party, or just want a comfortable plus size kaftan to wear around the house, I’ve got you covered! I have spent most of this year in West Africa, where kaftans are worn as street wear. Women throw this dress on in the morning, slide their feet into sandals, and are out the door. It’s the perfect garment for hot, humid weather. It catches the breezes while also keeping you modest. Apart from some beach towns, you probably won’t see many kaftans on the streets in the United States. But, this is a wonderful garment for lounging around the house in the evening, or on your days off. It almost feels like wearing nothing at all, but you are perfectly covered if you need to answer the door or go out to the post box to get the mail. In this post I am showcasing a few of Amazon’s top-rated kaftans for plus size women. I have gone through and picked out the kaftans with the highest customer ratings. I have bypassed the ones with one or two five-star ratings, and selected the ones with dozens or even hundreds of five-star ratings. My goal is to help you find the best loungewear within the least amount of time; because, I know you are busy! This lovely dress is one of the most highly rated kaftans for plus size women. It is made of a soft poly-satin that women say is very comfortable. This kaftan is very roomy, and fits women up to size 4X comfortably. Women smaller than 1X seem to complain the most about the garment being too large. This is a kaftan; it is supposed to have a lot of fabric and fit loosely. The animal print shown is just one of the many fabrics you can choose. This one is very popular, with over 40 positive reviews on Amazon. Only one of the reviews was critical (at the time of this writing), and even that reviewer had a few positives to mention, including that wearing this was a subtle way of letting your partner know you aren’t in the mood. Funny! But, let’s admit it, we all have those days! Ha ha! Lots of women reviewing these kaftans say they order lots of them. One even called herself the “Kaftan Queen” she has so many! It is understandable, because the prints on these dresses are amazing! With everyone raving about how comfortable they are, it is easy to see why a gal would want to have at least two or three. And, at this price, it’s easy to afford to buy a bunch! I’m not allowed to tell you the price, so you will have to click through to Amazon to see. But, trust me when I say they are affordable! Get in the Mood for Your Kaftan Party! Here’s a little something to help you get into the mood for your kaftan party! This looks like so much fun, I am thinking the hubs and I are going to have to host one very soon! If you love these kaftans, you might also these nightgowns! Check ’em out!! 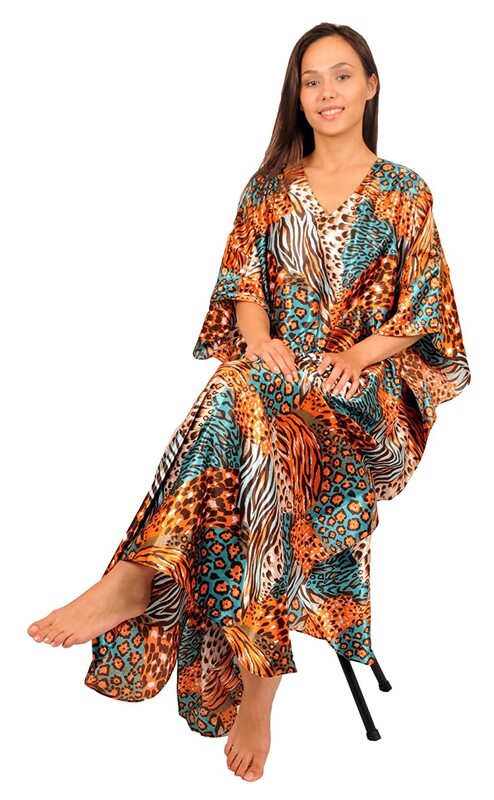 More Kaftans for Plus Size Women at Amazon!